Now lay out all units as shown at left. 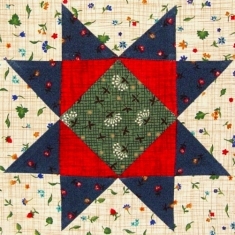 Sew three horizontal rows, pressing the top and bottom row seams to the center, and the middle row seam to the outside. Sew the rows together and you are all done! Congrats on another block well done! 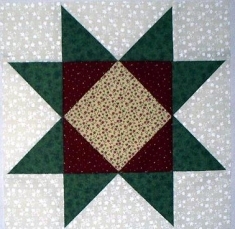 Here are thirteen Eight Pointed Star # 4 blocks, alternated with Snowball blocks. 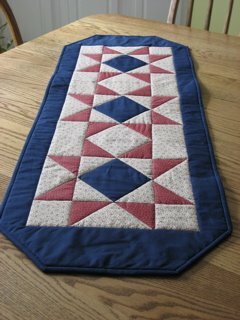 To make these alternate blocks, cut 12-1/2" background (tan) blocks and use 3-1/2" squares to "sew off the corners" in the same way you did the corners of the Flying Geese, and Center units. Have fun! Here's Teresa's! Karlene's! Alice's Runner!